A parliamentary committee has approved amendments proposed to the law governing remuneration and benefits for the president and vice president for the state to cover expenses of the pair’s private residences. If the president and vice president choose not to live in the official residences, the amendments stipulate that the state should provide employees and cover other expenses out of the budget allocated for the official residence. The amendments submitted by Progressive Party of Maldives (PPM) MP Riyaz Rasheed were sent to a select committee for review following preliminary debate on March 31. The bill was sent to committee with 29 votes in favour and 17 against with no abstentions. 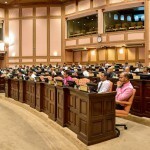 While pro-government MPs voted in favour, MPs of the opposition Maldivian Democratic Party (MDP) voted against the legislation. After completing the review process in two meetings, the seven-member committee voted unanimously to send the bill (Dhivehi) without any changes to the People’s Majlis floor, where it will be put to a vote. In addition to Riyaz Rasheed, the select committee comprised of government-aligned Jumhooree Party (JP) MPs Ilham Ahmed, Hussain Mohamed, and Ahmed Sameer along with PPM MP Moosa Zameer, Maldives Development Alliance MP Ahmed Amir, and Adhaalath Party MP Ibrahim Muttalib. The opposition MDP was not represented in the committee. Immediately after being sworn in on November 17, President Abdulla Yameen announced he and his vice president – Dr Mohamed Jameel Ahmed – would be fulfilling a campaign pledge of only taking half of the MVR100,000 (US$6500) salary afforded to the head of state. “The reason behind this is that Dr Jameel and I both live a simple life. No matter what has been said about us we are not wealthy. We want to be an example to others and lead by example,” Yameen said. After assuming office, President Yameen announced that he would continue to live in his private residence while Dr Jameel moved into the official vice presidential residence, Hilaaleege. However, despite Yameen’s decision, the budget allocated for the official residence was increased by MVR2 million (US$130,208) in the state budget for 2014 – rising to MVR19.1 million (US$1.2 million). In December last year, Parliament’s Budget Review Committee Chair Gasim Ibrahim – leader of the JP – said the increased budget was necessary in case the president decides to move to Muleeage. “Unlike in the past, even media points out inconsistencies in what leaders say and what reality presents these days. I do not believe the public will be deluded about any of this,” Hamid said. This is Nasheed and GMR's fault! If Nasheed hadn't given illegal contract to GMR, Yameen wouldn't need to spend so much government money on his humble home.